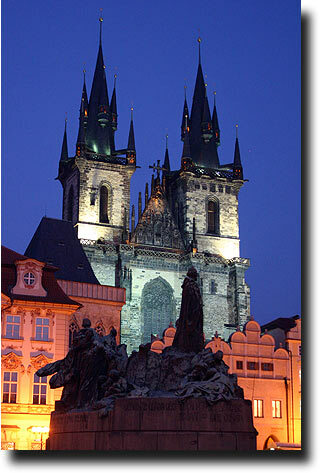 One of the most distinctive landmarks of Prague is the Church of Our Lady before Tyn. 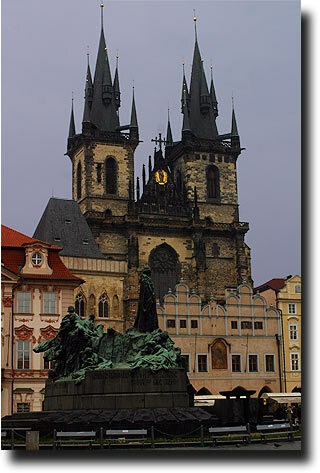 Built in the late 1400s, it was the main church in the city until the mid 1700s. Astronomer Tycho Brahe - from whom Kepler obtained the measurements of the planets' orbits that helped him formulate his laws - is buried inside. 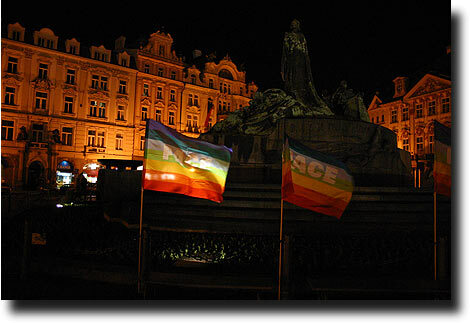 The Old Town Square that surrounds it is still the site of much town activity today. 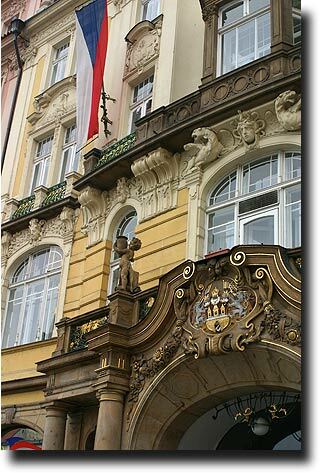 The facades of many of the buildings around the square bear enormous murals and ornate moldings. 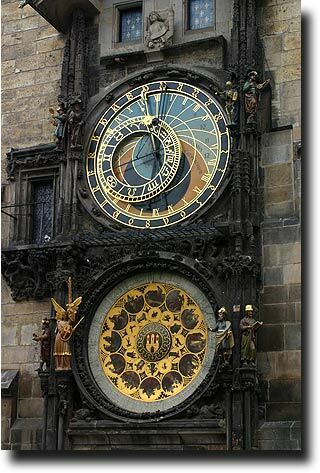 One of the most famous of the sights around town is the 15th century astronomical clock across the square from the church. 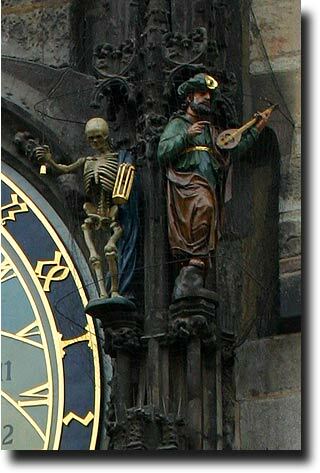 Every hour, on the hour, the skeleton figure pulls the cord that rings a bell, and figures representing the saints parade in the two niches above the clock. 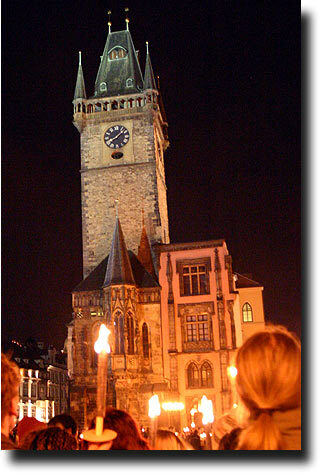 A gathering place for tourists, the plaza below is also one of Prague's pickpockets' favorite haunts! 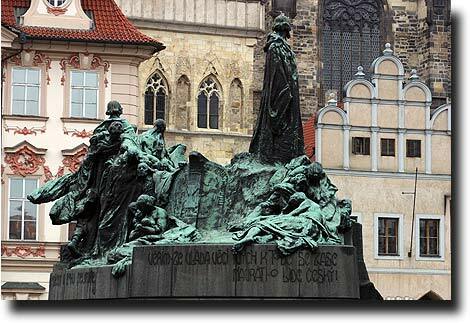 The monument to Jan Hus stands in the square. 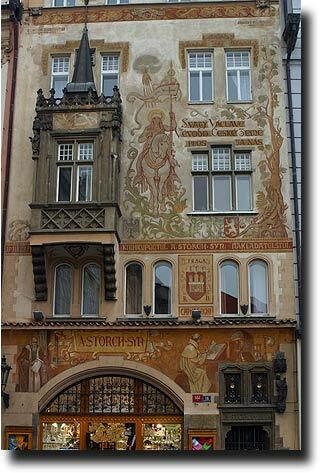 He was a Czech religious hero who was burned at the stake in 1415 and is admired as a man who gave up his life rather than compromise his beliefs. And even today, the square is a place for protest and "making your point." 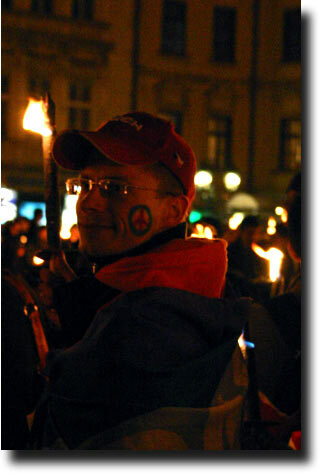 One night when I was there, a candlelight vigil was held 'commemorating' the 4th anniversary of the start of the Iraq war. 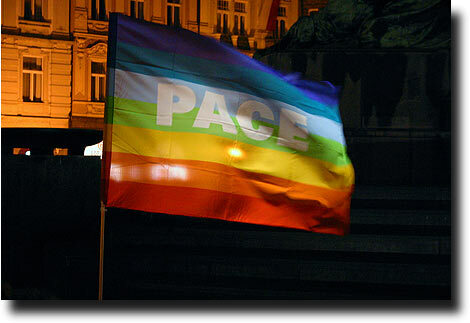 The square was filled with people demonstrating for peace. The mood was positive, and the crowd formed a huge circle in the middle of the square, sang, clapped, and made their point in a very positive way. But happy things go on there as well. 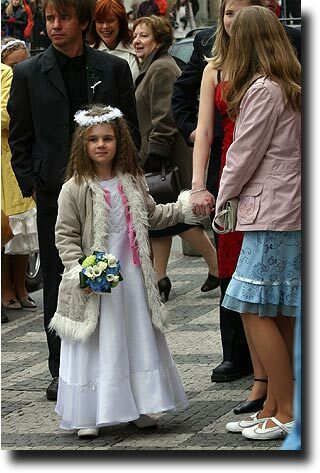 I was lucky enough to walk by one day as a wedding party was entering a smaller chapel on the square, complete with blushing bride, groom, father, and flower girl!